Even though Missouri State allowed Bradley to recover from a 20-2 hole, the Bears recovered and survived from being upset. SPRINGFIELD, MISSOURI---In a pivotal middle of the season matchup against the Illinois State Redbirds, Dequon Miller's Missouri State Bears received reinforcements in the form of previously out of action Camyn Boone and Chris Kendrix to force overtime, thanks to a spectacular game-tying three from Miller, in route to a "down to the wire" 84-81 victory. On Tuesday, they kept the winning streak going inside the friendly confines. Led by the recent returnees to action, the Bears quickly attacked the freshman filled Bradley Braves prior to allowing them to fight back in a "much closer than it needed to be" win. Neither making a field goal for almost the first two minutes, the two Missouri Valley Conference squads seemed to have left their shot-making abilities in the locker room. However, the most important shot of the game was made at the 18:01 mark by Missouri State's Dequon Miller. With the "jazzy junior's" triple, the Bears' offense exploded for sixteen more points as a part of a 20-2 beginning of the game roar (10:28 remaining in the first half). 20-2 Bears? Less than ten minutes in? Indeed! In fact, Paul Lusk's defense caused the Braves to possess one more turnover (10) than consecutive missed shot attempts to start! Though, things would change. The first Braves' basket was by sophomore Donte Thomas at the 8:31 mark (22-6 BU). 4 minutes and 14 seconds later, we had ourselves a single-digit ballgame. What happened? A complete role reversal! Missouri State became careless with the basketball, resulting in turnovers, while Bradley finally saw the "biscuit" fall in "the basket." Moreover, success from beyond the arc, treys by "fab freshmen" Ronnie Suggs and Dwayne Lautier-Ogunleye, drew them within nine with 4:17 remaining until halftime. Yet, the Bears finally woke up from hibernation and kept their opponent from drawing any closer before the intermission (37-29 MSU). Crisis averted...for now. When halftime arrived inside JQH Arena, two scenarios went through the MVC fan's head. Would the Braves wilt in the second half like against Evansville? Or, would the Bears falter as versus Indiana State? Ultimately, the answer was neither. Coming out like a bullet from a gun, Bradley utilized two quick three-pointers, another from Lautier-Ogunleye and one by Luuk van Bree, to make the contest a two-point game. The crowd was becoming restless for seconds continued to run off the clock with the margin where it was. But, last week's MVC Newcomer of the Week Jarred Dixon swiftly gave the home fans something to cheer about with a jumper that followed a pair of made attempts at the charity stripe. 41-35 Bears! Even though the Braves would tomahawk chop back within a single-possession, Missouri State would always answer with an Obediah Church jumper or Camyn Boone deuce until Boone broke this one back open with five consecutive points. 52-43 Bears! While three-pointers between the 12:40 and 5:20 marks by Chris Kendrix, Ryan Kreklow, and Dorian Williams would keep Bradley charges at bay, Brian Wardle's squad actually found themselves down only four with 2:18 remaining in regulation. Furthermore, the Braves were only trailing two succeeding a jumper by Antonie Pittman. But, a mental mistake, an unintentional foul by Dwayne Lautier-Ogunleye with the game clock holding 13 seconds and the shot clock winding down, sent Missouri State's Dorian Williams to the free throw line with the chance to put this one away. Swish! Swish! The Bears once again had a multi-possessional advantage. Rushing the ball upcourt, Bradley's Donte Thomas hurled a triple. No dice! The Missouri State Bears had fought off the Bradley Braves. When Missouri State experienced their defeat at Indiana State, the scoring prowess and court presence of Camyn Boone and Chris Kendrix was direly missed. With Dequon Miller as the only double-figures scorer in action then, the Bears' opponent had the luxury of packing the paint when he drove, resulting in very contested attempts to be fired. Bradley wasn't playing the "same team." Getting to the free throw line upon being fouled on a three-pointer, Kendrix was active and effective, resulting in a career-high 21 points on just eight shot attempts! Moreover, he was excellent from the charity stripe, a place where the Bears naturally struggle, as he made 12-of-13. 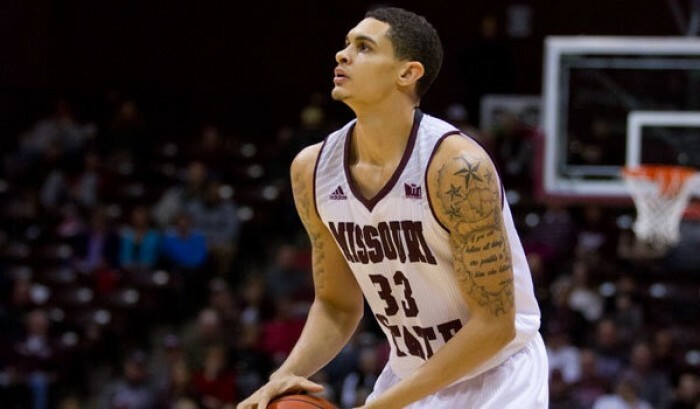 Furthermore, Missouri State "star senior" Camyn Boone was back to being a load down low. Instrumental in the initial pull away by producing four consecutive, no youngster wearing red had the ability to stop the Arizona native on offense or defense. Boone finished with a near double-double of 18 points and 8 rebounds. 10-13 (6-5) Missouri State will travel to second-placed Evansville for a showdown with the Purple Aces Saturday. VAVEL USA will have coverage live from the Ford Center. Making a name for himself in his season debut versus Ball State, Dwayne Lautier-Ogunleye has been pegged as the "Freshman to Watch" when it comes to Bradley Braves basketball. Unfortunately for him, Missouri Valley Conference teams have planned accordingly. Beginning with Northern Iowa holding the 19-year old to 5 points, which was much lower than his season average at the time, "DLO" has had a very quiet first go-around in "The Valley." In fact, in the first meeting with Missouri State, the Bears held him scoreless! Tonight, he did not allow it to transpire again. Having played very well of late, in two of his last three he had posted double-figures points, Lautier-Ogunleye started sizzling from beyond the arc in the first half (9 points) prior to sustaining his success with 11 in the second half, equaling a career-high 20. Also producing very good nights, Luuk van Bree came one away from a career-high by adding 18 points while Antonie Pittman had 10. The 3-21 (1-10) Bradley Braves host Indiana State Saturday.